Sail away to new heights of artistic fun. 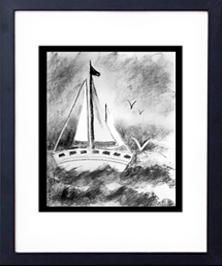 This beautiful scene of a sailboat on the high seas is created using vine charcoal. Sharon specifically made this project to be simple and completed in one sitting. In this project you will learn the foundations of charcoal drawing. You will learn the beginning concepts of using lost and found edges as well.